(Click image to enlarge) Against this hugely oversold technical backdrop we still have positive macro tailwinds. The yield curve is positive, interest rates are dropping, inflation is dropping, the Rand is still showing strength over the medium term, JSE earnings yields are higher than inflation, annual foreign purchases of SA stocks and bonds are now above water and believe it or not the SA business cycle indicator is showing continued growth. 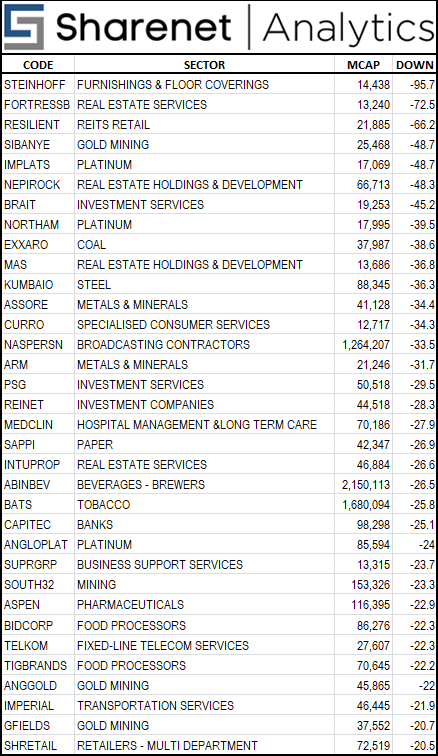 There are no doubt some serious bargains among this list, but many shares are down for good reasons (Steinhoff). If the TOP40 makes a hard bounce off oversold levels, many of these counters will magnify the move of the index which could provide some good trading opportunities.